Welcome to the Country Quiltshop Vlijtig Liesje. A quilt shop in a country atmosphere in the outskirts of Maarssen, in the heart of the Netherlands, where the outdoors, cosiness and love for crafts are central. Hello, I am Hanneke Kwakkenbos owner of Quiltshop Vlijtig Liesje. After my textile education HTS for the Apparel Industry 'Mr.Koetsier' I worked at the Hema and Hunkemoller. In Hilversum I started giving quilting lessons and after the move to Tienhoven a quilt shop was added. The store and teaching studio are located in a log cabin on private grounds in the outskirts of Maarssen near Utrecht. In the middle of the beautiful nature of the Vecht region, is our cozy shop, where I give Patchwork and Quilt lessons weekly to groups of students up to 10 people. The quilt shop offers you a wide range of quilt accessories and a beautiful collection of quilt fabrics from famous brands. The quilting lessons can be followed by both beginners and advanced students. I personally guide course participants at their own level. When it comes to quilting lessons, I think it's important that everyone enjoys making beautiful quilts and of course learning good and new techniques. I also design patterns and quilts in romantic and vintage style and occasionally some nice objects for the holidays. The store is open from Tuesday to Friday morning from 9.30 am to 1 pm. Saturdays only by appointment. ATTENTION: Sometimes I have adjusted opening hours, for example when I am at a trade fair. This will be announced in red on time in the homepage. so take a look before you come from far away. Quiltshop Vlijtig Liesje is a well-known quilt store and webshop in the Netherlands and Belgium because we regularly organize fun events and let many of us hear. For years we have held a quiltrondvaart on the Linge in the spring and in the autumn. this is a pure pampering day on the water and for a very reasonable price. Also in 2014 we were on TV with a broadcast from broadcaster MAX. Quiltshop Vlijtig Liesje is a cozy store, where we like to give advice and help you to make your quilting project a success. You can also follow us via Facebook and the Blog of Vlijtig Liesje. 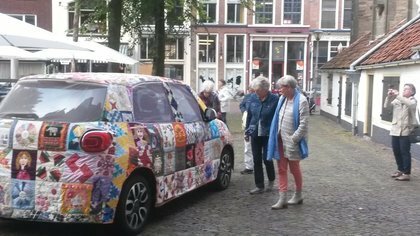 Our company car, a Fiat 500L, has received a patchwork cover with blocks in which more than 150 quilters from the Netherlands and abroad have cooperated. The cover is an initiative of Hanneke Kwakkenbos, from Quiltatelier Vlijtig Liesje from Oud-Maarsseveen. More than 150 quilters from the Netherlands, Germany, Belgium, America and Italy have submitted patchwork blocks after a call from Hanneke Kwakkenbos. 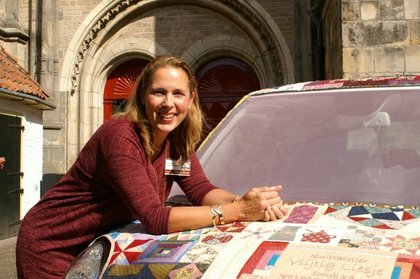 They were then sewn onto a fabric mold of the car, provided with filling and machine quilted by Marjolein Eysberg. Gerrie van Elburg has edged the fabric parts. The result is a colorful and informative object that gives a good impression of various patchwork embroidery and quilting techniques. This work of art symbolizes the connection between quilters, wherever they are on the world. Quilters exchange pieces and share knowledge and patterns. Friendships often arise in quilt groups. Working together on a joint project also gives a lot of fun. 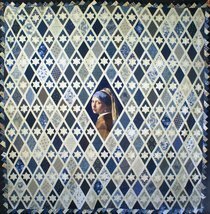 With this quilt Hanneke won the 2nd prize Traditional and the 2nd Audience Award at the Open European Quilt Championships in 2014. The quilt traveled in 2015 to Den Bosch, Brussels and even to Moscow.